Nilesh Raje has his articles published earlier with International Institute of Business Analysis, ProjectTimes, Business Analyst Times and ManagementNext magazine. He's generously agreed to write some posts here at Better Projects. Here is the first. Rightly said, changing position is a task that needs to be performed and not to be enjoyed. Should it be the latter then it is bound to detrimentally affect one’s career. A promotion often involves a whole new set of challenges, which even an astute manager may have difficulty in overcoming it. The way one performs in their new role or position can either make or break them in their career. Dr. Michael D. Watkins, leadership – transition guru has recently released his new book YOUR NEXT MOVE: The Leader’s Guide to Navigating Major Career Transitions (Harvard Business Press; October 6, 2009) which tries to zero in on roadmaps to overcome the challenges associated with one’s move in the corporate world. The move could be one's promotion, joining a new organization, an international assignment, or taking charge of an organization during crisis. The promotion challenge – How to outperform the expectations of those who promoted you and excel in your new role. The leading-former-peers challenge – When one is promoted to manage a team that were formerly your peers, accept the fact that relationships have to change and focus on what’s good for the business. The corporate diplomacy challenge – The art of influencing others and building alliances, which are absolutely critical for getting the things done. The on-boarding challenge – Transition into a new business unit or joining a new organization one must clearly identify individuals both inside as well as outside the organization who can help you in meeting your agenda. The international move challenge – Leading international assignments it’s vital to effectively communicate with your subordinates from an unfamiliar ethnic culture and ensuring a smooth transition while relocating one’s clan. The turnaround challenge – Taking over an organization that is in very deep trouble and figuring out issues with customers and competitors that have been threat to the business. The realignment challenge – Define strategies one needs to employ to create the necessary changes in the organization before problems result in a crisis. The STARS portfolio challenge – By the end of the first few months one needs to demonstrate substantial progress in motivating people and securing early wins. According to the author each of the move revolves around two core challenges: Personal Adaptive Challenge and Organizational Change Challenge. Given your strengths, competencies and mind-set the personal adaptive challenge addresses what are the key personal shifts one personally needs to make when they get promoted? One should understand what new competencies one needs to develop. The organizational change challenge focuses on what one needs to accomplish in the business by identifying the current state of the organization and key stakeholders. Dr. Watkins is the cofounder of Genesis Advisers, a Newton, Massachusetts-based leadership development firm specializing in transition acceleration programs and coaching. He also holds the credit for his international bestseller The First 90 Days: Critical Success Strategies for New Leaders at All Levels. 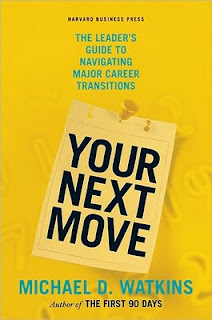 The book tackles opportunities and challenges people usually face while moving into new positions and provide some useful guidelines to prove your mettle in the critical first three months in a new job. One can identify what type of position they are moving into and strategies required for succeeding in each of them. These 'challenges' are interesting to me, as I am regularly changing roles and companies. Some seem like good checks for yoru spronsor and key stakeholders, and others can be useful for making sure you and your team are going to work together smoothly. I guess there are lessons here beyond the promotion. Very nice synopsis. Thanks for the post.